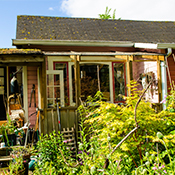 The Community Heritage Register is a list of 50 properties or resources that are formally recognized as having heritage value. 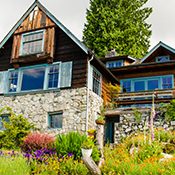 Having property listed on the register does not prevent a property owner from altering their property, as long as the alterations follow existing laws, such as the BC Building Code, Zoning Bylaw, etc. 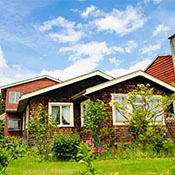 There are benefits to the property owner if their property is listed on the Register. 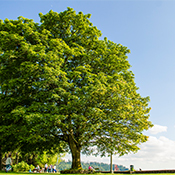 Binning Residence National Historic Site of Canada is located on a small, steeply sloped site on a well-treed and quiet residential street in West Vancouver, British Columbia, with a view of Burrard Inlet. A small two-bedroom house, it consists of two rectangular volumes that are stepped down to take advantage of the natural topography of the site. With its low massing and flat roof and situation within mature vegetation, the residence virtually disappears into the landscape. 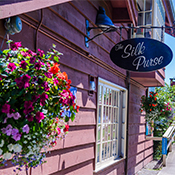 The original Black Cat was a tea house and grocery store, built in 1922 and operated by a Mrs. Lochead and a Mr. Gillis. 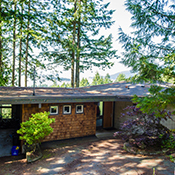 Designed in 1954 for Joan and Bruce Boyd, this single-storey bungalow of wood-frame and cinder block is tucked by architect Ron Thom into a natural, treed slope that faces south on lower Sentinel Hill. 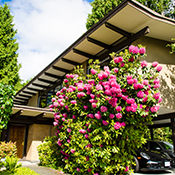 Designed by architect Ron Thom and completed in 1957 the Carmichael House reflects the influence of noted American architect Frank Lloyd Wright on the West Coast Modern Style of architecture through the use of “honeycomb” hexagonal modular planning. The one storey home features a large angled chimney and the outdoor spaces are screened with heavy timber trellises. 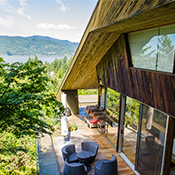 The landscaping features natural west coast vegetation and the home is sensitively integrated into the topography of the site, enabling an unobstructed view of English Bay. 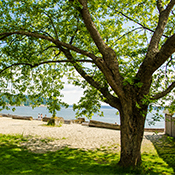 Caulfeild Park is an approximately 1 km long waterfront park, which is separated from Lighthouse Park by a lone waterfront residence. 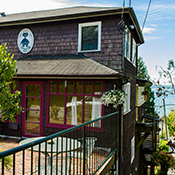 This unusual house is a local landmark, perched high on the crest of a hill overlooking English Bay. 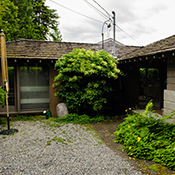 It is significant for having been the residence of artists Vito and Sybil Cianci, both graduates of the Vancouver School of Art. 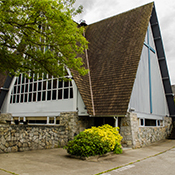 It was designed in 1933 by architect Hanns Carl Berchtenbreiter, who had recently abandoned an established practice in Germany to come to Canada. 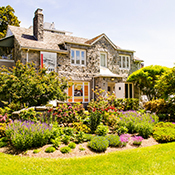 The historic place consists of the house and garden at 2512 Haywood Avenue, located near the village of Dundarave in West Vancouver. The original cottage, now much extended, was built in 1923 and is situated beside Marr Creek which runs through the property. 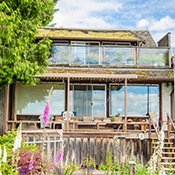 This two-storey post-and-beam home was constructed in 1958 by builder Bob Lewis for Don Erickson and his family, brother of architect Arthur Erickson. Lewis was known for his interpretation of the West Coast Style and for constructing homes quickly and cheaply using modular construction techniques. This home features design input from Arthur Erickson, and was the only time Mr. Erickson worked with this popular local builder. 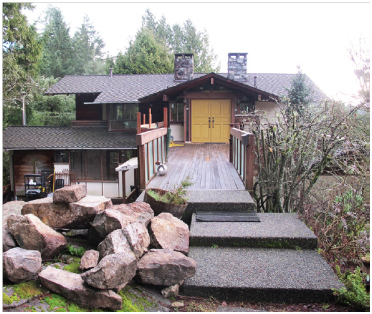 Mr. Erickson’s influence can be found in the siting of the home on the lot, which takes advantage of natural light and views, the integration of interior and exterior space and the original post-and-beam design of the upper deck. 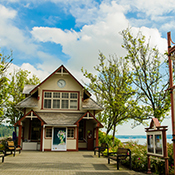 The Ferry Building has historical value for its associations with the municipal ferry and bus services, both of which were very important to the development of West Vancouver; and for its present use as a community art gallery, reflecting the municipal commitment to cultural presentation. It also has architectural value for its use of Arts and Crafts features. 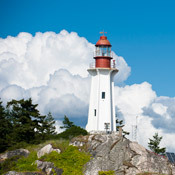 Its longstanding public use has made it part of the ongoing historical experience of countless residents and visitors. Gertrude Lawson lived here from its completion in 1940 until her death in 1989 at the age of 96. 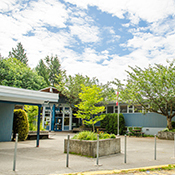 The daughter of influential pioneer John Lawson, who is remembered at John Lawson Park, Gertrude Lawson spent part of her youth in West Vancouver and taught primary grades at Pauline Johnson and Hollyburn Schools from 1923 to 1952. The Clubhouse is located along the sixth fairway of the Gleneagles Golf Course. 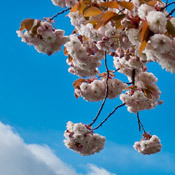 It is surrounded by mature native plants and has views across an apple orchard to Larson Bay. 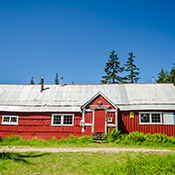 Nestled in the mature, Coastal Western Hemlock ecosystem of Hollyburn Mountain’s south slope, this unique group of approximately 100 ski cabins, constructed mainly between the late 1920s and 1965, is the only surviving ski cabin community on the North Shore. 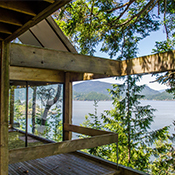 The Hollyburn cabins are two basic types: board and batten or log, depending on available source materials, with a barn style roof, one main room for living and a ladder up to a sleeping loft. Knowledge gained from the experience of cabin building was shared between cabin groups and in this way, a strong sense of community developed, one that continues to this day. 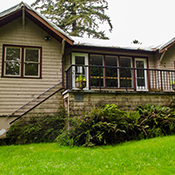 Hollyburn Lodge is a one-storey, gable roofed wood frame cabin, used as a ski lodge and warming hut for the recreational area on Hollyburn Ridge, located in Cypress Provincial Park. 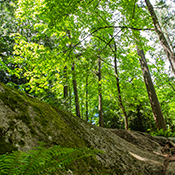 The Lodge is adjacent to First Lake and is located within a network of ski and hiking trails in the hemlock, cedar and fir forest of the Ridge. 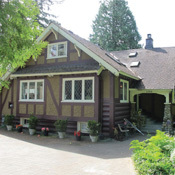 ‘Klee Wyck’ is important as one of a few remaining examples of ‘rustic’ estate properties in West Vancouver that pre-date construction of the Lions Gate Bridge. The property has historical value for having been home to Dr. Ethlyn Trapp from 1942 until her death in 1972. Dr. Trapp was a nationally significant woman, who was prominent as a physician, a humanitarian, a pioneer in cancer research, and a patron and friend of the arts. She represents the small group of educated women who succeeded in non-traditional careers in mid-20th-century Canada. She served as president of the BC Medical Association and was awarded the Order of Canada in 1968. 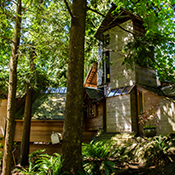 Dr. Trapp named the property ‘Klee Wyck’ in honour of her good friend, the world-renowned BC artist, Emily Carr. 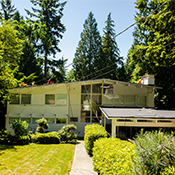 Merrick House is valued as an excellent and well-preserved example of the West Coast modernist domestic architecture for which West Vancouver is renowned, and for its association with the influential architect and native West Vancouverite Paul Merrick. 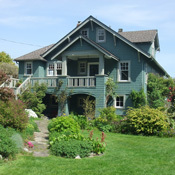 Navvy Jack Thomas House and its grounds, located at 1768 Argyle Avenue, faces English Bay and is adjacent to John Lawson Park. Built around 1873-74, the house was moved slightly west and south of its original site in about 1921 to allow for the opening of Argyle Avenue. 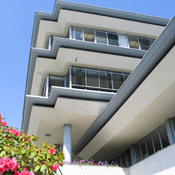 It is owned by the District of West Vancouver. Built in 1922, the school was designed by local architect Hugh Hodgson. 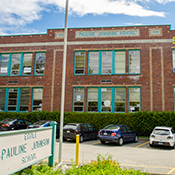 The school is named after Pauline Johnson, a Mohawk poet and writer who lived and died in Vancouver. 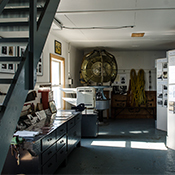 The Light Station site has served as a familiar landmark and life safety station for marine traffic since the first wood-framed lighthouse was erected here in 1874. 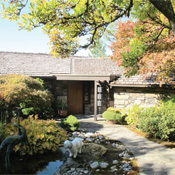 The Ray House was designed in 1961 by architect Daniel Evan White and represents a unique Japanese-inspired take on West Coast Modern Style. A key feature is the heavily glazed upper story featuring tapered exposed beams and thin soffits, which give the impression that the house is floating above-ground. Designed by Mr. White at the beginning of a long and influential career the home features key elements of his design style including bold, geometric designs, sculptural exteriors and heavy use of wood and glass. 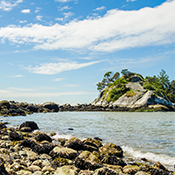 Like other West Coast Modern Homes, the house is integrated with the natural environment and constructed around a natural bedrock outcropping. Resthaven is located within the Lower Caulfeild Heritage Conservation Area and in many respects, this house and its mature garden exemplify the heritage values and character-defining elements of the Lower Caulfeild neighbourhood. 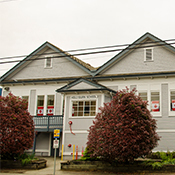 The Rush House has heritage value for its association with the early development of West Vancouver's historic Ambleside neighbourhood; for its representation of the early residential properties of West Vancouver, first owned by the Rush family; and for its Craftsman style architecture. On December 4, 2017 Council adopted Heritage Designation Bylaw No. 4952, 2017 which provides for legal protection of the Rush House in exchange for infill development on the property under Heritage Revitalization Bylaw No. 4951, 2017. 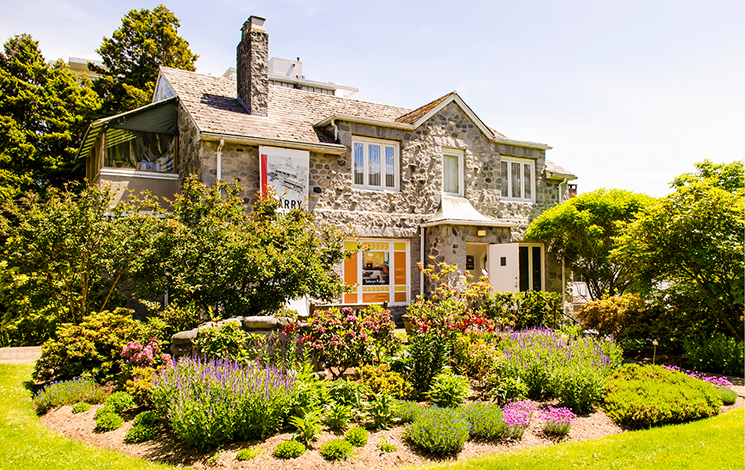 The Silk Purse Arts Centre at 1570 Argyle Avenue, located on the waterfront in the Ambleside neighbourhood, was built as a summer cottage in 1925 and subsequently converted for year-round residential use. 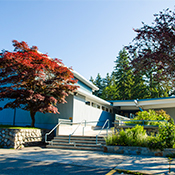 It is now the home of the West Vancouver Arts Council and is used for arts education and performances. 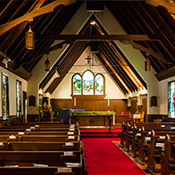 St. Francis-in-the-Wood, a stone-and-timber Anglican parish church, is located near the Village Green in the Lower Caulfeild neighbourhood. It includes the original church (1927) and the later alterations and additions (1937 and 1957), the parish hall, the landscaped grounds, and the lychgate. 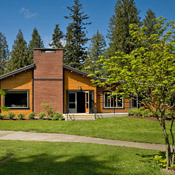 The Hutchingame House was designed and built in 1927 as a modest, Craftsman-style cottage but was expanded over the years to accommodate growing family needs. The front-gabled, one and one-half storey house features original wooden window assemblies, along with stucco cladding, with half-timbering detailing and log cabin siding, which were together applied as the house evolved. 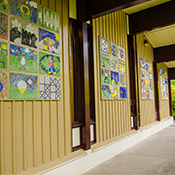 The Hutchingame family purchased the property in 2003 and have undertaken significant rehabilitation work. 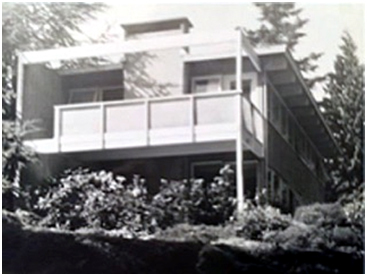 On July 24, 2017, Council approved the Heritage Revitalization Agreement and Heritage Designation for the Sutherland House that enabled subdivision of the property as incentive to:· retain the Sutherland house as a municipally-designated heritage building on the northern lot (Lot 1); and· construct a new single-family dwelling on the southern lot (Lot 2). 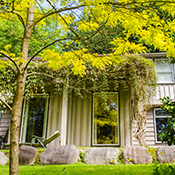 A spectacular house and an exceptional example of the West Coast Style of architecture, it was designed by Hungarian-born architect Peter Kaffka in 1964 for the original owners Major Paul Sykes and his wife. Council adopted Heritage Designation Bylaw No. 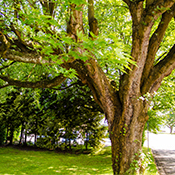 4879, 2016 which provides for legal protection of the Sykes House in exchange for subdivision of the property and building a house on the new lot created under Heritage Revitalization Bylaw No. 4877, 2016. 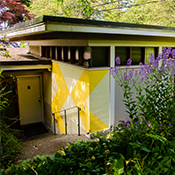 The Thorson House has architectural value as an important and early example of West Coast modernism and as a design by innovative architect Duncan S. McNab. 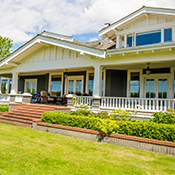 The Toby Residence is a pioneer of the West Coast Style and includes many of the defining elements of that style in both the exterior and interior details. Council adopted Heritage Designation Bylaw No. 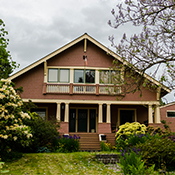 4814, 2015 which provides for legal protection of the Toby House in exchange for subdivision of the property and building an infill house under Heritage Revitalization Bylaw No. 4813, 2015. 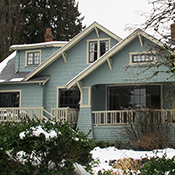 The Vinson House is an excellent, very early, and unusually intact example of a Craftsman-style bungalow (also called a California bungalow) to be built in the area. Council adopted Heritage Designation Bylaw No. 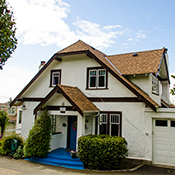 4891, 2016 which provides for legal protection of the Vinson House in exchange for development of the property including adding a suite within the Vinson House and two infill residences under Heritage Revitalization Bylaw No. 4890, 2016. 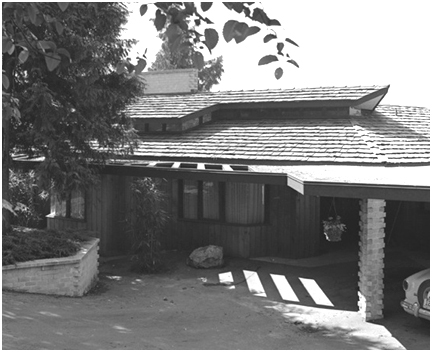 The Wagner Residence is located at 6003 Eagleridge Drive and was designed in 1963 by architect Percy Underwood, as his home. It was constructed by craftsman Einer Silberbauer and completed in 1965. 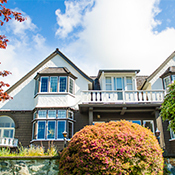 The house was designed and constructed in an unusual variation of the West Coast Style of architecture, with references to traditional romantic architecture. 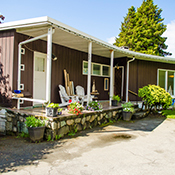 The property was purchased by Yvonne Wagner in 1967 and has been maintained in excellent condition by Ms. Wagner ever since. At the request of the property owner, the Wagner House is now protected under “Heritage Designation Bylaw No. 4785, 2014”, which was adopted on October 6, 2014. 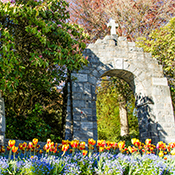 The War Memorial has considerable value to the community as the place where West Vancouver residents have gathered every Remembrance Day since its dedication in 1925, to remember those who have fallen in the wars. Designed by Toby Russell Buckwell Architects in a modernist style, the District’s offices stand on a south-facing slope, quite distinctive in appearance from the surrounding houses and apartment blocks.